YogaReach founder Char Grossman and her students at InMotion say “thank you” to Gaiam for a donation of mats. InMotion (beinmotion.org) is a new wellness center in Cleveland that helps clients with Parkinson’s disease and movement disorders to focus on their abilities – not disabilities. Your yoga mat is a safe place. A place to learn how to let go of tension and trauma, and connect with resilience, strength and inner peace. Now, thanks to our corporate sponsor Gaiam, the 11 yoga supply grant recipients pictured here can experience that for themselves. 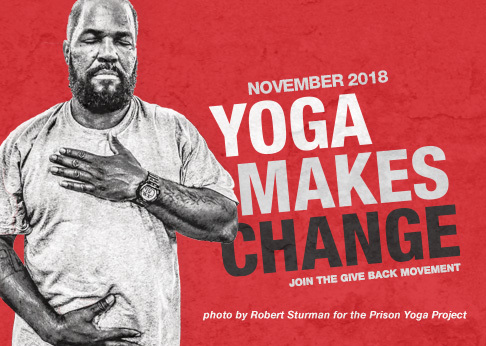 In partnering with Give Back Yoga to underwrite our supply grant program, Gaiam has donated more than 1500 mats this year to help certified teachers across the country launch new classes for underserved populations — from veterans and first responders, to at-risk youth and those in recovery from addiction or eating disorders. This supply grant program serves as a kickstarter for yoga service projects of all kinds, making a big impact to our mission of sharing the therapeutic benefits of yoga with those who are most vulnerable. Through this partnership, we’re also able to supply mats and props to students who graduate from one of our teacher trainings, helping them to establish Give Back Yoga programs like Eat Breathe Thrive, Mindful Yoga Therapy, Yoga for 12-Step Recovery and more in their own communities. We’re honored to help Gaiam stand behind their philosophy of “Yoga for everyone,” by working together to share the gift of yoga with the world. It all begins on the mat…won’t you join us? Learn more about our supply grant program. Letter from a Reader: Gratitude For "Daring To Care"
I live below poverty level and recently had to give up a monthly subscription to YogaGlo, where I self taught w/videos online, due to huge rent increase. Have you any suggestions as to how I may continue a practice online? I’m 66 and have been benefiting greatly from practicing at home. Thanking you now for your attention to this request. Many blessings and thanks for the work you do!